Exporter of a wide range of products which include kids hooded jacket, kids sleeveless jacket, kids full sleeves shirts and brown kids jacket. 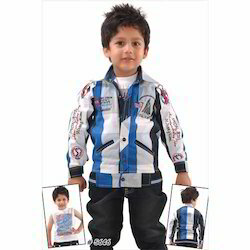 Offered by us is a fabulous range of Kids Hooded Jacket that provides excellent comfort to the wearer. These sets are sourced from the leading vendors of the industry, who make use of finest quality fabric in tailoring the array. Besides, our efficient tailors offer excellent options on these shorts in terms of their sizes and colors, suitable for the clients. Looking for Kids Jacket ?